Known as the biggest dreamers of the zodiac, it’s no surprise that the ruling planet of Pisces is Neptune. They spend a lot of time living in a fantasy world they create to escape the harshness of reality. That is why Neptune in Pisces is known to be highly imaginative. In astrology, Neptune represents instincts, illusion, spirituality, psychic abilities, intuition, occult, and confusion. Neptune in Pisces always has big plans in mind, but they often lack the organization and discipline needed to follow through on those plans. They would rather put together a grand time in their mind than go through the motions and the crazy effort it would take to carry it out. Their physical energy doesn’t match their creative process and things can get lost in translation. This is why Neptune in Pisces tend to forget about important events or even simple day-to-day responsibilities. (This can lead to problems in relationships). 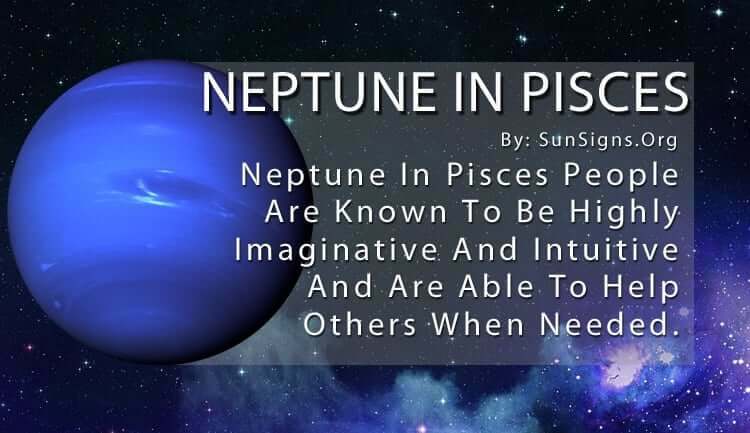 But because of their sensitive nature, Neptune in Pisces is also highly intuitive and are able to help others when they need it most. You don’t usually have to ask them for help either. They can tell when people are hurting or struggling and they are able to put themselves in anyone’s shoes. (Take the Spiritual sign test). The ability of the Pisces Neptune sign to sympathize and empathize with people makes them the perfect person to come in and help. They know exactly what is needed and they will put in the effort at that time to get it done. They tend towards being a martyr, which means they aren’t afraid to sacrifice themselves to aid others. This is when they feel most useful, so you can trust them to follow through on a caring mission. The Neptune in Pisces people get so consumed by the reality they create in their mind that all other things fall away. But when they get called out on their forgetfulness, they only retract further into their own mindset. Because they are so sensitive, those around them have to be careful when trying to get them to fall in line. The only thing Neptune in Pisces zodiac sign have to be careful of is those who want to take advantage of them. Because they are so trusting they can also be gullible. They have a tendency to let people walk all over them because of it. The other side of this is their potential to spiral down into drugs, alcohol or nicotine addiction when they are confused or disappointed. While they may fail in completing everyday tasks, the Neptune in Pisces will do whatever is necessary to protect people. This is why they often have a large social network consisting of people from all walks of life. They have an open mind and are very accepting of everyone. This is why they are able to understand what others are going through, and why they are able to help them. They sometimes don’t know how to handle challenges or unexpected changes, so they use any means necessary to escape from the reality of a tough situation. There is always the threat of substance abuse with someone who prefers fantasy to reality. (Get tips on mental fitness). It’s up to their large social circle to keep them from falling into depression. If they get lost in their own mind it can be difficult to find them and pull them out from their own illusion. But give them a problem to solve or a person to save and they will be right back in the game. How Couples Give Each Other Bad Habits!